Yes, a hybrid post--our experience in Sioux Falls, S.D. mixed with the mundane, the helpful, the humorous, seldom informative--all randomness in this journey we call full-time RV'ing. Nothing real captivating about this town of 150,000 mid-western folk and one we pretty much just "hung out" at. Not bad, not great, just sort of there--like a bout of constipation. On our drive up to Sioux Falls on I-29--"Modern Rest Area"-- it's the little things that impress the folk of Iowa. I wonder what the state did with the "Cornfield Outhouse-12 miles" signs. 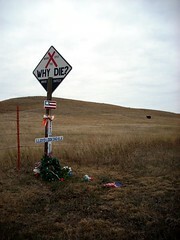 Working in the 911 world for two plus decades, I was a bit taken aback by this South Dakota signage. The other side reads "Think!". Since 1979, the state has posted the spot of each fatality with this marker. The "Think!" seems instructive and a bit presumptuous. How was the person who rolled their car due to their first grand-mal seizure suppose to THINK about preventing it? Or had a new tire freakishly blow out? Or swerving to miss the abundance of wildlife that roams these woods? I get the "contributing to your own demise" element (DUI, texting, speeding, etc), but I had a rare sentimental moment (wife to verify) and felt it was a bit out of bounds. Perhaps the fact the victim's family must approve of sign placement is enough of a caveat to OK the program? Now, on to cheerful news. A tad too close at our S.D. campground-- these are the nights you hope your neighbors do not have beans or cabbage on the menu cause nothing spells aggravation more than rectal zephyrs drifting onto your dining room table. Seriously, the Sardine family even nixed their stay here. This used to be the wife-trainer dog defender when we walked near our former country home. It is now our "slide-out yardstick"-- before we extend our living room slider, we measure this between the exterior wall of the rig and its nearest obstacle to make sure we aren't mowing down an electrical pedestal, pole, tree, etc. in its path. Cheap insurance. Apparently the wife's BIKE t-shirt was in the dirty laundry. Sioux Falls does have an amazing bike trail system that loops the entire city paralleling the Big Sioux-age River--yes, it was green and stagnant, probably due to the drought. The 25 mile, all paved trail connects to a dozen parks, many with themes (soccer, softball, dog, volleyball,etc). Well done! Standing in front of Sioux Falls--yeah, a tad smaller than Niagra. And woah, what's up with my crooked helmet, I think the wife gifted me the combination cycling-brain injury model. When you have been married for 25+ years (to the same woman), there can be a lot of silence inside the cab of the Jr. Ark on the days we travel to a new RV park. So, the co-pilot fires up this app on her I-phone and researches the interesting facts of small town USA as we cruise through them. For example, our current town of Tea, S.D. was originally named Byron. When they wanted to become a postal community in 1906, USPS said "pick another name, Bryon already exists, and make it a short one". So, the local community of German influence who enjoyed their afternoon tea suggested--TEA. Honesty in advertising, including the pitchfork--all about branding at this Sioux Falls bakery. And no, we were good Christians and did not succumb to temptation. Our righteousness was short-lived as we became heathens and fell to temptation at the Phillips Avenue Diner. When in South Dakota, do as the Wisconsinites do-- fried cheese curds bathed in ranch dressing. Either we are traveling with a stealth kitten or the Midwest's interstate roads are the worst we have experienced in 5,000+ miles. Relaxed after a week's visit in eastern South Dakota enjoying sleeping with the windows open all night for the first time in amonth. We are ready for a 130 mile drive for a one night stay in Fairmont, Minnesota on Saturday and then coasting into Lanesboro, MN. for a week with another very mild travel day. We promised to slow it down in July and we hope to PARK IT for a month in August. I thought I would put that in writing for my wife's sake. My husband and I are really enjoying following your journey. We also love your sense of humor! We leave Arizona two weeks from today to begin our full-time RV life. Over the past 18 months we have sold our home, our belongings, our vehicles and have purchased a 40-foot fifth wheel and a Ford F450 Super Duty to tow it with. We are in our mid-40s so we definitely will be working on the road. In fact, our first "on the road job" begins early September at Amazon. We also love running, biking and hiking. We have both run numerous marathons and we are looking forward to all the outside opportunities this lifestyle offers. If you're interested, check out our blog at cr8ingthelife.blogspot.com. Wait till you get to NY state! Worst roads ever! Rts 88 & 86, pallump, pallump. Lots of tar snakes, pot holes. The truck and RV bump, bumping along. Very irritating and make for a long, difficult drive. Ogling at Ogallala, NE for a week!